I couldn’t be more excited to share this with you guys. I love doughnuts, I mean that’s no secret since I love to snack on anything that has to do with chocolate. 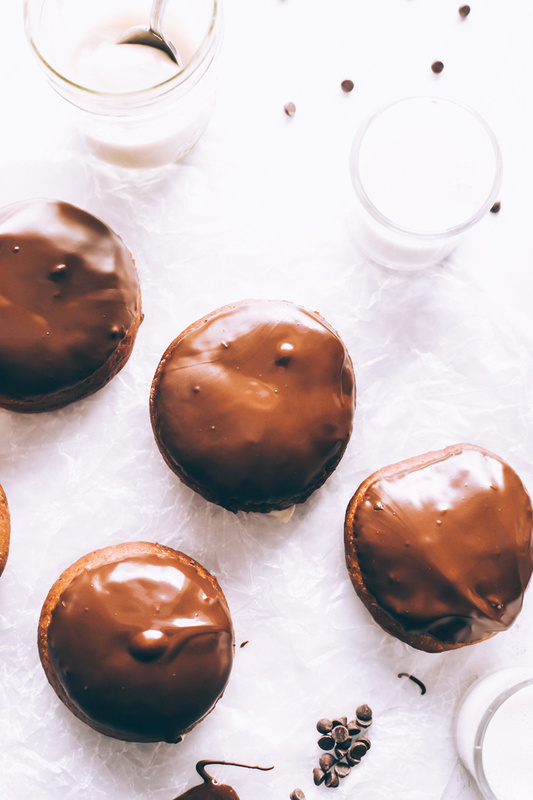 But these…these Vegan Boston Cream Doughnuts take the cake or in this case the doughnut. When I was younger (in my twenties) I would always go to Dunkin’ Donuts and get myself an iced coffee and pair it with one of their Boston Creams. When I started to eat more plant based and vegan I said bye bye to those and figured they were gone forever (sad face). Now, I’ve had vegan doughnuts before but what I hadn’t had was a Vegan Boston Cream Doughnut so this to me right here is all sorts of magical. Can we just talk about vegan pastry cream for a minute. Like who knew it was basically a vanilla custard I’ve been looking for my whole life! Ok, little exaggeration there but it’s so so so freaking good, like I can’t even deal. I’m almost a little mad at myself for only knowing how to make it now. I should have known this sooner but it’s 2018 and I’m trying not to be too hard on myself this year. It’s ridiculously easy to make and you can use it for just about any dessert. 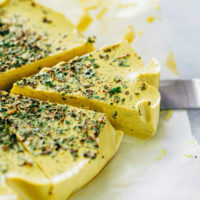 I was thinking of adding this to my Mini Vegan Custard Tarts or my Mind Blowing Vegan Tiramisu because add a little espresso to this cream and all I can say would be: You Go Girl! Whoop Whoop! This recipe is in no way healthy. It’s vegan but it’s not healthy. I don’t make this all the time. I think it’s perfect actually for the holidays coming up like Easter maybe or Passover as a little splurge or your morning breakfast perhaps? Let me tell you, waking up to the smell of doughnuts is not a bad thing, I can attest. I’m no way a professional baker even though I love to bake. Making dough is probably one of my least favorite things to do so I usually ask my hubs to do it because he’s good with that kind of stuff. But for these vegan doughnuts I gave it a go because it’s fairly easy and not super annoying. For this dough, it’s a pretty standard recipe. I used regular active dry yeast not instant active yeast. What you have to do with active dry yeast is activate it (duh, right) by adding 1.5 cup warm water with 1 tsp sugar and 2 tsp of the active dry yeast. Stir it then let it sit for about 10 minutes. You’ll see it actually start to rise in the bowl. It’s pretty cool. Then you take from there what you need for any kind of dough recipe you’re making. Instant activated yeast you don’t have to activate yourself, it’s instant hence it’s name. 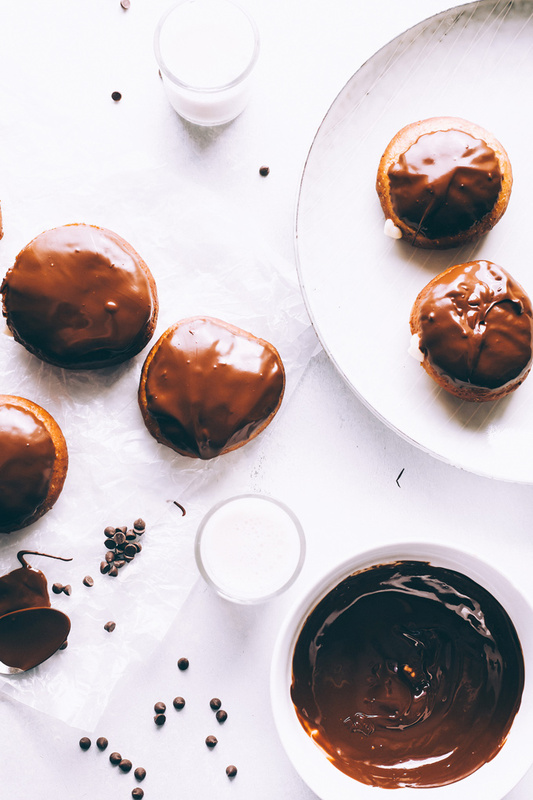 Once you have your doughnuts made and they’re cool to touch you’ll need to fill them with the pastry cream then dip them into melted dark chocolate. Clearly my favorite part of this whole thing. They’re totes good without it but they’re GREAT with it. I used dairy free chocolate chips with a tsp of coconut oil for the chocolate top. I melted the chocolate chips down in my regular oven, as I don’t have a microwave, and it takes about 5 minutes. When they’re melted, you take them out of the oven then add the coconut oil. 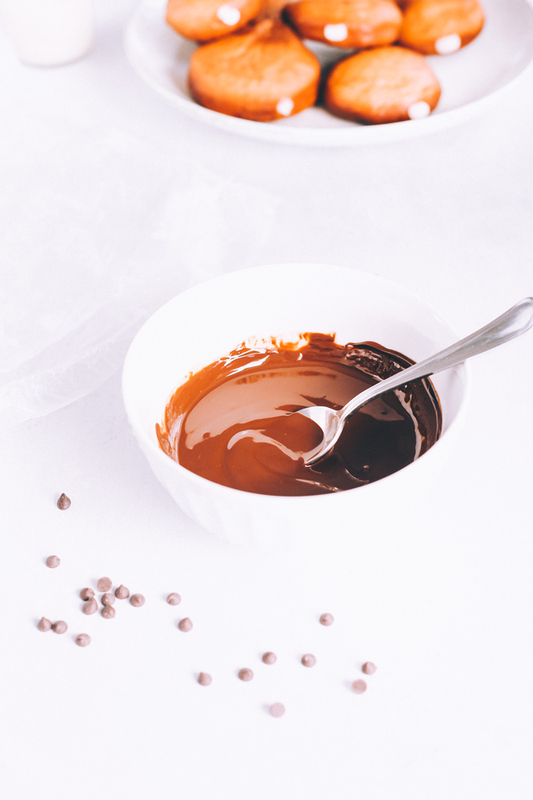 Don’t add the coconut oil while it’s still in the oven and don’t put the dish back in to melt the oil, the oil will melt from the hotness of the chocolate. 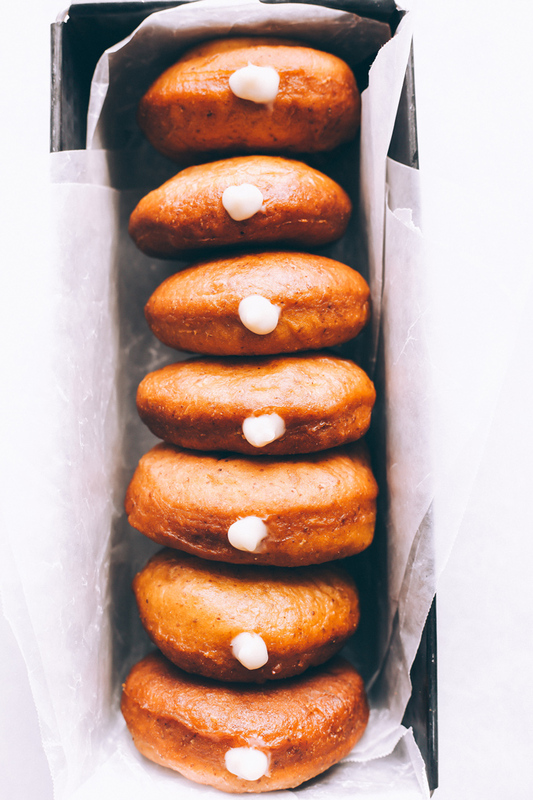 Dip the tops of your doughnuts and place them on a wire rack lined with parchment paper. They take 10 minutes to set if the climate is cool but will take a little longer if you have a warmer climate. You can pop them in the fridge for 10 if you need to, no biggie. Get your favorite dairy free milk ready because once you have these out, it’s gonna go down girlfriend. UPDATE: It was brought to my attention that recommending doughnuts as a treat for Passover is not allowed. You cannot eat yeast that has come into contact with water or which has fermented during this holiday. So, doughnuts are a BIG NO NO. Thanks to one of my readers, Jane, for enlightening me with this information. These are generously filled with creamy vanilla custard and coated in a thick layer of dairy free chocolate making this a snack must have! In a small saucepan whisk together all vanilla pastry cream ingredients. Stir mixture over medium high heat until it starts to become thick and bubbly. Once you get it to a low boil lower the heat to low and stir continuously for a few minutes until the mixture gets to a thick pudding like consistency then remove from heat. Let it sit off the heat until it gets to room temperature then cover it with plastic wrap as tight as you can get it and place it in the fridge to set while you prep to make the doughnuts. In a stand mixer with the dough hook attached, combine the flour, flaxseeds, and vital wheat gluten. Run it until combined. Add in the melted coconut oil, sugar, and vanilla extract then the activated dry yeast mixture. Run until the dough comes together. Take the dough out of the stand mixer and knead it a few times. Shape it into a ball, place it in a glass bowl, cover it with a cheesecloth or plastic wrap and let it rise for 1 hour, it will double in size. When the dough has doubled in size lightly flour your work surface and transfer the dough onto it. The dough should be fluffy. Knead it a few time again and it will become more elastic and bouncy. Let it sit for another 15 minutes covered. After 15 minutes roll the dough out till it gets to about 1/2 inch thickness. Use the top of a mason jar to cut out the doughnut shape, about 3" in diameter. Gather any scraps you have left into a ball and roll out to cut more. Line a baking sheet with parchment paper and dust it with flour. Place the doughnut shaped dough on the baking sheet about 1.5 inches apart, cover them and leave them to sit for another hour so they can double in size. When the doughnuts have risen heat up 32 oz organic canola oil in a heavy bottomed pot over high heat. It should be 350 degrees but if you don't have a thermometer you can test to see if your oil is hot by sprinkling water over top of it. If it bubbles or sizzles it's hot and ready to go. Be careful when you do this. When I'm frying I wear glasses. Using a slotted spoon or spatula, gently lift doughnuts one by one off the baking sheet and carefully lower into the hot oil. I had to cook mine for 2 minutes on each side so watch your doughnuts. Fry them on each side until golden brown. 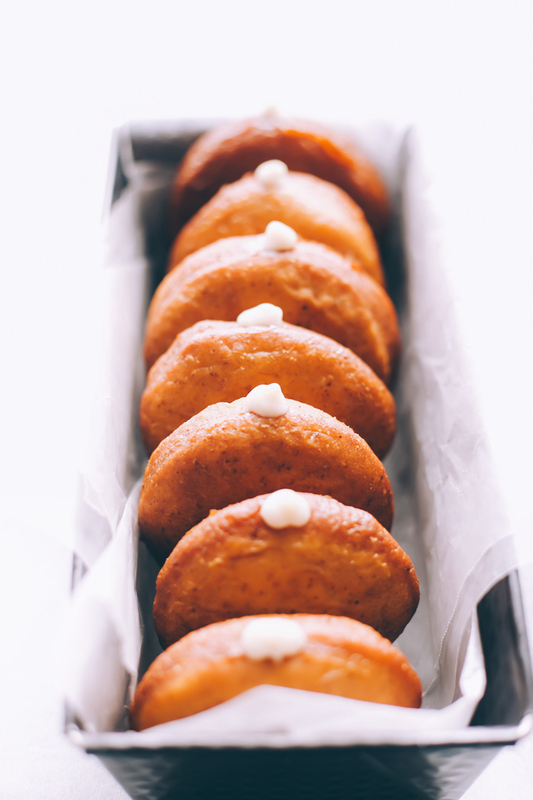 Place doughnuts on a paper towel lined wire rack and let them sit there until cool to touch. Once cool to touch you can add in the pastry cream and top with melted dark chocolate. Use anything that can poke a hole into the side of the doughnuts like a chopstick. Move it around, back and forth, up and down to create a nice big pocket for the cream. Because the vanilla pastry cream has been in the fridge it will be super thick and you'll need to blend it or whisk it back to having a more loose consistency. Fill a piping bag with a round tip and add in the pastry cream. Generously fill each doughnut with cream. Some will overflow and that's ok! Once all doughnuts are filled melt down the dark chocolate. 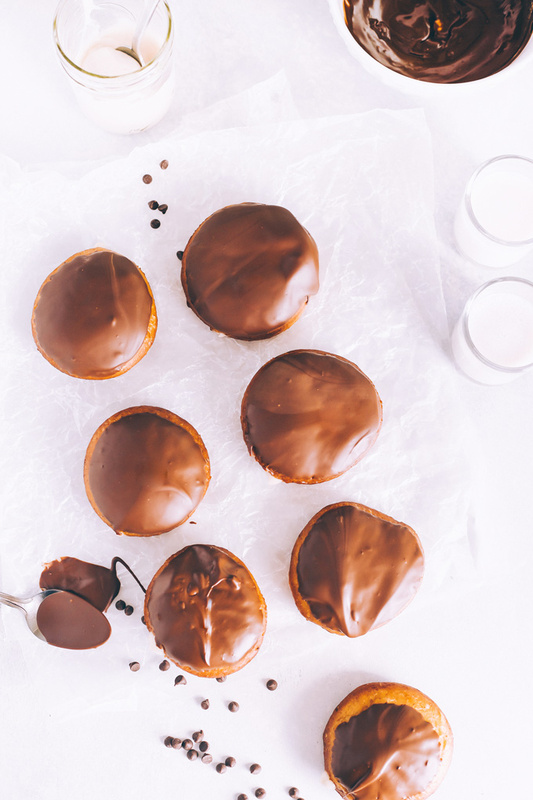 Dip the tops of each doughnut into the chocolate and place back on wire rack to set. The chocolate will hardened up in about 10 minutes. Alternatively you can place them in the fridge for 10 minutes too. 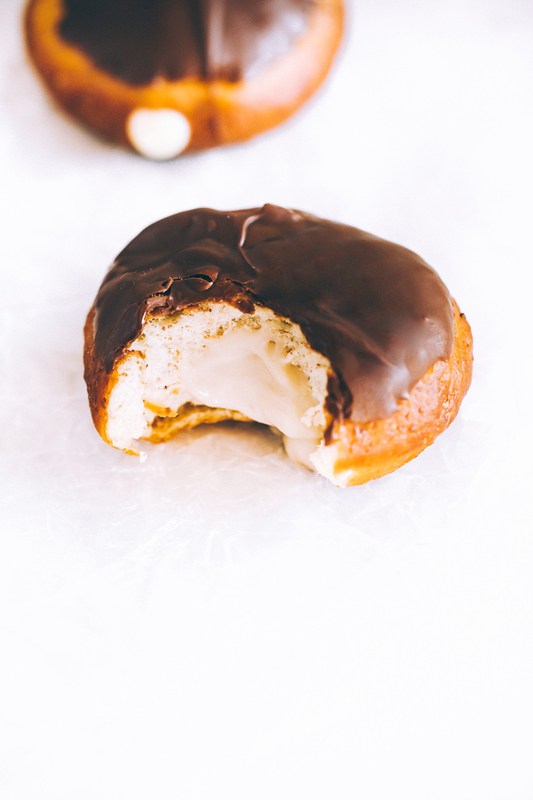 Serve with your favorite dairy free milk and Enjoy your Vegan Boston Cream Doughnut! If you’re perusing for donut recipes, skip this one. The measurements are not correct and you WILL end up with a batter and not a dough (this is not a user-error and has nothing to do with ingredients used). 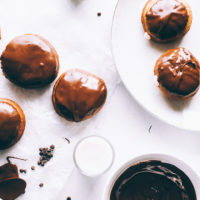 Search for vegan yeast donuts and find an alternative that works for you. I skipped the cream recipe altogether because of reviews – but vegan pastry cream recipes are very easy to find. I opted for one that didn’t contain oil. Just curious if the amounts for the cream are correct: 1.5 cups of flour and sugar? I’m researching other recipes for vegan pastry cream and I’ve noticed most say 1/2 cup flour and 1/3 cup sugar per 2 cups of plant milk. Hi there. I was just attempting this recipe, and I think the amounts are off for the cream. I tried twice, and both times the cream ended up a big sticky mass fairly quickly. I followed the directions exactly as is stated. I think there is way too much flour for the amount of liquid. I’m going to try another cream recipe, because my daughter and I are excited to try them! Hi Whitney I’m not sure why it’s turning up a sticky mess for you. When you put it in the fridge it firms up then you have to blend it again to make it smooth before using, have you done that? wow I HAVE to make these!! I can’t wait. They look so beautiful. I will be sure making them & putting them on my instagram. Hopefully for family for memorial day weekend! The same happened to me! And the cream turned into a huge glob also, I don’t think the portions are correct. Wow! 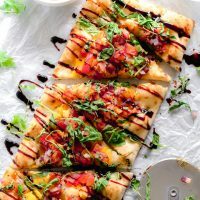 These photos are drool worthy.. and that recipe is so easy to follow! Love it. Keep shining boo. Love all your content! Thanks Casey! Apparently it’s not enough. Also vegan pastry cream is standard across the board. This recipe is almost exactly the same as Mary’s Test Kitchen recipe. The ingredients are even listed in the same order. It kind of looks like you’ve just used her recipe…? Hi Isobel, I credit Mary’s Test Kitchen! Love her site. 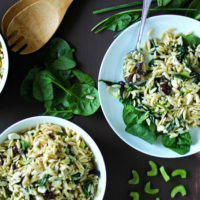 I wrote up the entire recipe here and used my own words along with taking my own photos.